Although I have never been a sports fan, there is an inextricable link between sport and the Great War. Sportsmans and Footballers battalions were created in the New Army and a clear link was established in propaganda between heroism and success on the sportsfield to the same virtues on the battlefield. Sporting heroes were used as examples to encourage others to enlist and the press made much of footballers, rugby players and cricketers who had joined up. While books on sportsmen in the Great War have been published before, this new title by Stephen Cooper takes a slightly different angle. He focuses on one sport, Rugby, and one club, Rosslyn Park in south-west London. While their Roll of Honour was a long one, he takes fifteen members of the club and retells the story of the Great War through them. The book then follows a chronological approach and takes each player in turn, putting their life and war service into context. The men in these tales take us not only to battles like Ypres and the Somme, but above the Western Front with the Flying Corps and on board ship in the Zeebrugge Raid. The stories are very well written and well constructed and in no way become repetitious. In fact they can easily be dipped in and out of, and even the most well read of Great War enthusiast will get something from them all. I found this a fascinating book and far from the usual ‘Roll of Honour’ publication that come out in their droves each year. Here is the context, here is the depth and humanity often so lacking in long lists of names. 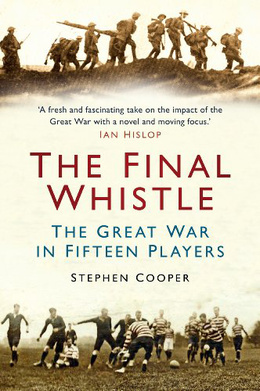 Stephen Cooper brings alive these long dead players and takes us with them from the touch line to the battlefield on a fascinating and moving journey. Highly recommended. The book is available from The History Press. Read a review about this in Stand To the other day and now with your review and my love of rugby I need to get it. Only trouble is The Park are old rivals of my club but in this instance I will make an exception. Funnily enough we are playing them at end of October.